To make the dressing: In a medium bowl, whisk together the lemon juice, pomegranate juice, and mustard. Add the olive oil, whisking until incorporated. 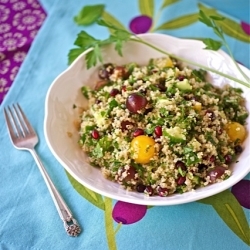 To make the salad: Pour the quinoa into a bowl of cold water and wash it, rubbing it between your hands. Drain and repeat until the water is clear. Bring the 4 cups water and quinoa to a boil in a large saucepan. Stir once and cook, uncovered, over medium-high heat for about 10 minutes, or until the liquid is absorbed. Transfer to a large bowl. Let cool. Add the persimmons and pomegranate seeds to the quinoa. Mix with a fork to keep the quinoa fluffy. Add the parsley and chives. Pour the dressing over the grains and fruit and mix with the fork. Carefully add the feta cheese. Taste for seasoning and chill for at least 2 hours. Serve. The salad may be prepared through step 3 up to 8 hours ahead, covered, and refrigerated. Remove 15 minutes before serving. Just before serving add the dressing and cheese and mix together. Taste and adjust the seasoning. Make this a year-round salad. Substitute white wine vinegar for the pomegranate juice. Omit the persimmmons and pomegranate seeds, and add to the quinoa 1/2 cup diced radishes, 1/2 cup diced European cucumber, 1 cup diced peeled carrrots, and 2 tablespoons finely chopped fresh mint.